- If the market stay as is, without retreat I would reach my annual goal, should I keep up with the monthly savings. - Gazprom announced annual dividends as 0.42 USD per ADR. 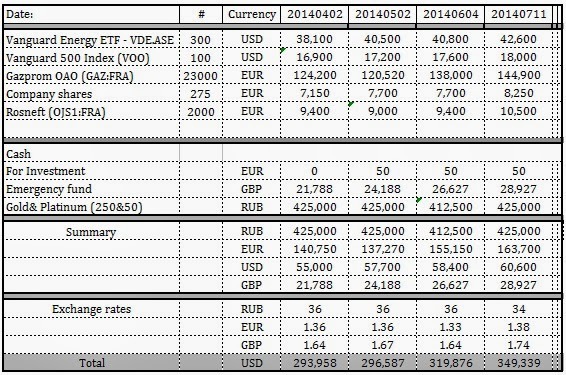 At the current Gazprom ADR price (~8.7 USD) this is 4.8% in dividends only. For my holdings this is 9,660 USD. I will not add to portfolio now, as payment will be made end of July. At the moment I am thinking of reinvesting dividends and buy 1,000 more Gazprom ADRs. - Rosneft announced annual dividends as 0.37 USD per share. At the current Rosneft share price (~7.3 USD) this is 5.0% in dividends only. For my holdings this is 740 USD. I will not add to portfolio now, as payment will be made end of July. I am thinking in reinvesting the dividends back into Rosneft shares. - One of the next post I will go through the dividends and total return for my holdings. This is to have clear picture of where I am. If instead of reinvesting dividends I choose to cash in, I would get 12 K USD a year in dividends before the taxes.